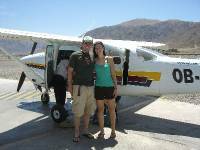 Blog from Nazca, Peru | Where is the Love? Nazca is famous for the mysterious series of lines that have been chiseled into the rocky dessert.Beyond the lines there is very little in Nazca so our hotel was about 15 minutes outside the town in the country side and on coming off the night bus from Arequipa we were also told it had a swimming pool.This lifted the spirits, until we actually arrived that was. To get the hotel we had to pass through what looked like a refugee camp on the outskirts of the town.There was a lot of rubble and hundreds of wicker tents and houses where people were sleeping.We later found out this was a neighborhood that fell down in the last earthquake that hit Nazca and when the inhabitants left several rural people who moved to Nazca had set up this village and laid a claim on the land.When we emerged through the other side of the camp we reached our hotel which was protected by a 12 foot perimeter wall topped with barbed wire and entered through the 10 feet steel gates.Nice place and in typical South American logic we later discovered the wall only protected two sides of the complex the other two being protected by a standard 3 feet farm fence. After catching up on some sleep we headed for our flight over the famous lines.The lines are a series of animal figures and geometric shapes that cover an area of 500m2.There are several theories of why they were in scripted and what the represent including they are an agricultural calendar, an offering to the Nazca god who could fly and the one I like most that aliens drew them! We boarded our little 5 seater Cessna plane and our pilot described the route we would take and the different lines we would see including the Triangles, Astronaut, Condor, Monkey, Spider and Hummingbird amongst others.Now despite being a world traveler I have never been the best flier and that is when Jumbo Jets are involved, never mind rickety looking 5 seater propeller planes that take off from a shabby desert air strips.The nerves set in. To my delight when the plane took off and started to perform incredibly sharp turns and tilts so passengers on both the left and right side of the plane could see the different shapes I started to really enjoy the ride.Hannah however was not enjoying herself so much.Motion sickness was getting the better of her and her interest in the lines waning.This did not put off the pilot and he continued to throw us about for better views of the lines for about 45 minutes.At the end we were all pleased to be back on the ground having managed to keep hold on to our breakfast. From the lines we then visited a very different tourist attraction.It was a Nazca cemetery that had been ravaged by grave diggers, as Nazca people were mummified and then buried in tombs with their most valuable possessions.The Peruvian tourist board had managed to salvage what they could of the graves and tombs and then made it a tourist attraction or heritage site.We toured the 12 tombs with our guide who had great delight in telling us the mummies heads we could see probably did not belong to the body they now sat on amongst other gory details. After this we headed back to the hotel for a quite night as we had an early bus to Pisco the next day.We enjoyed a few beers at the pool which we shared with the dead beetles that floated on the top of it. Roger Tonton ChatLe dit :Yeah, les fameuses liengs! Leur survol doit eatre quelque chose qui en jette vraiment, avez-vous pu les prendre en photo?Hereafter est le Clint Eastwood qui m'a pour ma part le plus de9e7u, mais je peux comprendre qu'on l'appre9cie, dommage pour la fin. Ce9cile de France y est en revanche tre8s mauvaise Question purement pratique pour finir: Benoeet ree7oit-il mes mails sur sa boeete gmail?Bonne route e0 vous deux pour la suite de l'aventure!